Pre-launch is a marketing technique which implies that as many people as possible know that a new product will be introduced on the market. Giving a specific date and time if necessary, whereby promoting this product heavily before it is officially on sale. The importance of the pre-launch phase is that while the production team is running up and down to deliver on time, the marketing team should be doing their magic to draw potential customers’ attention in order to make the official launch a success. The Woocommerce All Discount extension (WAD), enables you to manage your pre-launch period. You can use it to offer free gifts or any other discount in exchange of a customer sharing your product on social networks or who takes any action to make the product/event go viral. The plugin also enables you to give out targeted discounts before, during. and after your product launch. How do you implement pre-launch discounts? A product list is basically a defined group of products on your shop which you can use for action based conditions when creating a discount. There are two ways of creating a list: a dynamic list and a static list, choose one, then proceed. If you select “By ID” it allows you to select the products in the list by specifying their IDs. 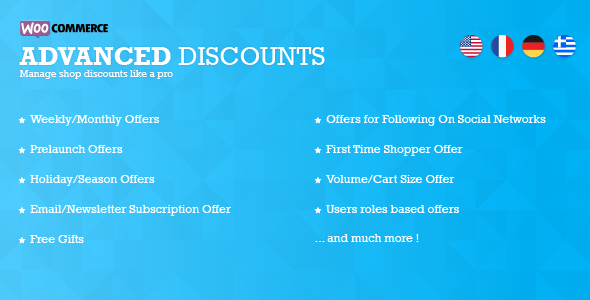 Pre-Launch discounts can be combined with almost all of the discounts available in the plugin. In fact, according to the rules set, you can create discounts on some products before launching them officially on the shop. Below is an example of how to set pre-launch discounts for anybody who has shared a product from the pre-launch list we have previously created from the shop. At this point the discount has been set for any customer who has shared at least one of the Woocommerce shop’s products. If you have any questions, mention it in the comment box below.